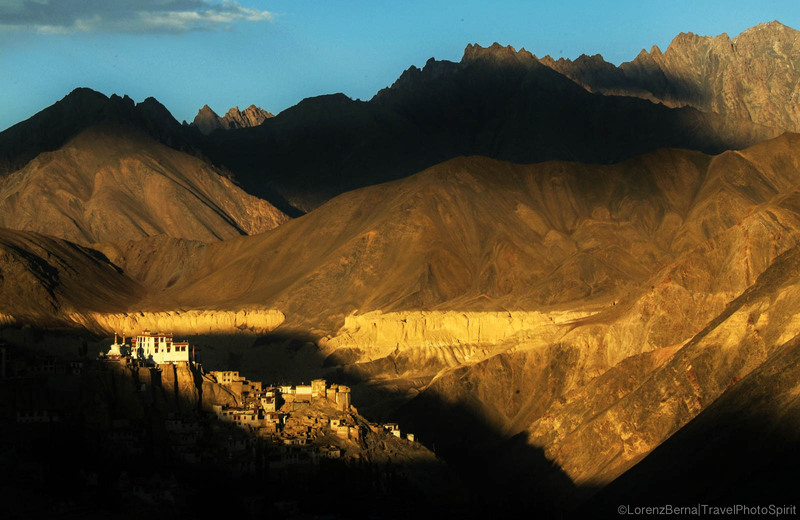 Sunset Lights on Lamayuru Monastery, Ladakh. Lamayuru is a Tibetan Buddhist Monastery situated at a height of 3,510 meters on the way from Leh to Srinagar in the remote district of Ladakh in northern India. This region used to be part of Tibet in the past, so it is filled with buddhist temples and monasteries and keeps a buddhist culture with its own traditions. I personally think that very few places on earth have a magnetic and somehow hypnotic power as the one I felt during my stay in this ancient Buddhist site. I believe that it is why this location has been and still is chosen by serious Yogi coming there for an intense practice of Meditation. In fact, the monastery is built around the original cave used by the Indian Saint “Naropa” for his ascetic practices. I really love this photo not just for the light, the subject and the composition but because it deals with the determination and courage One puts in action to get the shot pre-visualized in his mind. Studying the map according to the sun orientation, we realized that the only way to get the latest rays of the sun touching the gompa, was to climb a very steep mountain following the trails left by the goats. It took a great effort to reach the windy summit and believe me we arrive just in time to set up the tripod and get an original Picture of Lamayuru. A beautiful memory.